By the looks of the cover you’d expect this to be a story about a dog. That’s only partially true as it’s just as much about friendship, blueberries (that’s what you can see on Lucky’s nose), and understanding. I gravitated toward this new novel by Cynthia Lord based on loving one of her previous books, RULES. Narrated by Lily, it’s a honest view of life in a town dependent on the migrant workers who arrive each year to pick blueberries. She’s caught in the middle between an old and new friend, how to raise money for an operation to bring back her aging dog’s sight, and never knowing her mother who died when she was a toddler. Lily’s voice rings strong on every page. Girls especially will adore this… boys, probably not as much. Once they discover what lies ahead on the pages, they’ll be back to fantasy, sports, and laugh out loud books. I though was enriched by this quiet story. The themes covered make for a special ride. 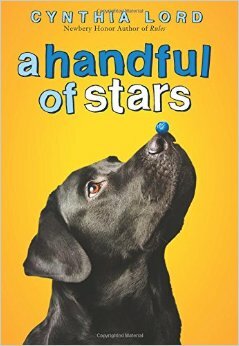 FULL PLOT (From Amazon): When Lily’s blind dog, Lucky, slips his collar and runs away across the wide-open blueberry barrens of eastern Maine, it’s Salma Santiago who manages to catch him. Salma, the daughter of migrant workers, is in the small town with her family for the blueberry-picking season. Blueberries are one of my favorite foods. I never really knew how they are harvested and brought to our table. I’m an expert now. I also couldn’t believe what I had missed all these years and had to immediately open a blueberry clamshell from the fridge. Yes, they each are capped with a star! Every plot point was given full consideration and a proper closing. It’s often not what the reader expects, but certainly makes sense for this story. Cultural biases are explored and in a way that makes us understand. Lily has much growth as she witnesses the various attitudes of people in her town. Oh my gosh, that cover just grabs me. Bravo to the genius at Scholastic who came up with that idea. The power and meaning of friendship has rarely been given such a thoughtful presentation. 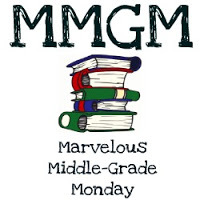 This entry was posted in Reviews and tagged A Handful of Stars, Cynthia Lord, Marvelous Middle Grade Monday, MG book reviews, Middle grade. Bookmark the permalink. This sounds really good, especially with the focus on migrant workers too. And who wouldn’t love the dog on the cover? Oh, I really liked this one! Loved the friendship between Lily and Salma, and the conflict between friends was realistically portrayed. Some great themes in this one. Loved the video. I thought this would have been a stronger story without the dog, but it did lend itself to a great cover! I am buying this, but you are right about it being a quiet book. I know you shouldn’t choose a book by its cover but… I am sucker for any kind puppy, but especially labs (we have had 3 litters over the years). I also adore blueberries, and the quote you selected is powerful. I loved your very creative and clever review of Cynthia’s book. I know, I had to go peek at my blueberries to make see the start — never noticed. Thanks for including the video of her book launch. It was so much fun to watch! I loved the bee box. Such a great story! Nice review. I love that cover. My granddaughter will be crazy for it. Thanks for the post.